Light bulbs on display at Albany’s Bi-Mart a couple of weeks ago. 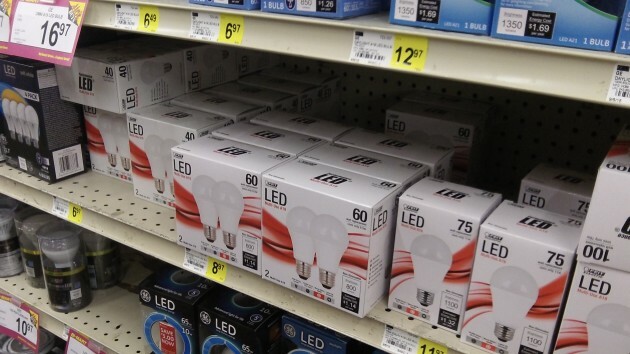 What happened to cheap light bulbs? That’s what I was wondering, briefly, when I sauntered down the bulb aisle in my favorite store a couple of weeks ago. Then I remembered the deal. What happened was that politicians in league with big business decided that we would all be better off if light bulbs became a lot more expensive. And so, in 2007, Congress passed and President George W. Bush signed an energy bill that, among other things, increased efficiency standards for light bulbs. Nobody in the great American public paid any attention or raised a voice in protest. At least I don’t remember any such voices. The provisions of the new law took a while to take effect, but when they did it became impossible to buy standard 100- and 75-watt incandescent bulbs. That was a few years ago. 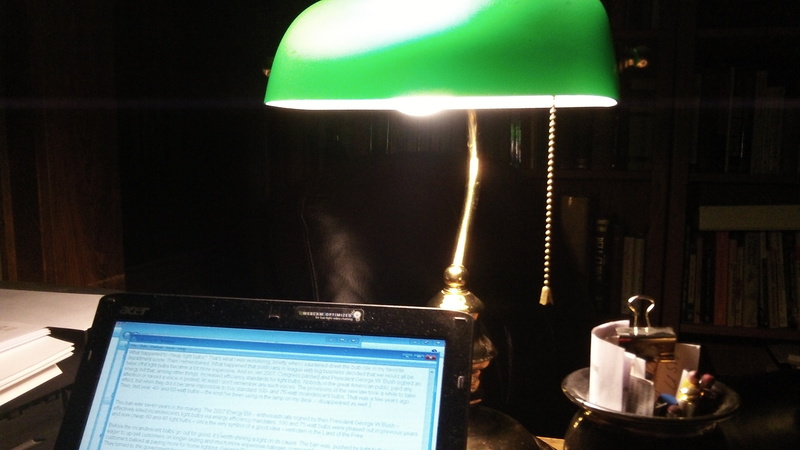 Then, last year, 40- and 60-watt bulbs — the kind I’ve been using in the lamp on my desk — disappeared as well. I wasn’t paying attention at the time because when the virtual banning of old-style bulbs was in the news about four or five years ago, I started hoarding light bulbs in various wattages. I noticed the other day that my supply was running a little thin, which is why I made a detour through the light bulb aisle. And that’s when I discovered, to my dismay, that I was too late. Cheap bulbs of the kind that had served me well had disappeared. One of the newer-type bulbs: Works no better than the old. I believe I recall your editorial years ago in the ADH in which you advocated picking up a few incandescent bulbs with each trip to the store and storing them. Sad to hear your stockpile ran out. I used the CFL bulbs for a decade or more, but never really liked them. I do like the LED bulbs though. Home Depot has LED bulbs which replace the old 40 or 60 watt bulbs for $3.97 from a few manufacturers (Cree and Philips). I prefer the 75 watt bulbs for our house (we have large rooms and tall ceilings), which are quite a bit more (about $7). I started using the CREE brand a year or two back, as I was impressed that they were Assembled in America at that time, and I promoted them amongst my friends. However, I recently noticed that while their 75 watt LED bulbs are still ‘Assembled in America’ their 60 watt bulbs are now assembled in Mexico. I don’t know what the difference is between the two bulbs which require the difference in price or assembly locations. I buy my light bulbs at the $1.00 store.They work and last just fine. You need to read the book, “Nudge,” by former Obama regulation czar Cass Sunstein. Individuals are not good decision makers. Free markets lead to bad choices. We need laws and regulation to push us in the way government desires. We are reminded of this reality every time we use the bathroom, everytime we switch on a light, everytime we drive a car, and soon here in Albany – everytime it rains. Welcome to the administrative state. A day late, I finally connected the text with the photo to know your “favorite store.” What a wonderful throwback to the early 1960’s or thereabouts. Lots of useful tools and unhealthy food. Hideous country music that’s thankfully unfamiliar. I actually enjoy shopping someplace that exudes a social/political attitude very different from mine, but I miss self-checkout. The only real problem I have is that backpacks are unwelcome at the 9th Street store in Corvallis as if they were somehow a greater shoplifting threat than womens’ handbags – think social/political again. Also, it’s the ugliest building in town since the old Rite Aid across 9th was torn down; doesn’t matter since it’s in the heart of Car Sacrifice Zone. So, I shop the one on SW 53rd instead. Back on topic, I’ve happily used fluorescent “twisties” since the earliest days, expecially since they were available in ghastly blue as well as sickly yellow. Use one of each together and they’re not that bad. The lifetime is totally random – some died in a couple weeks, some lasted a very long time. Brand and price hasn’t seemed to make a difference. I’m definitely ready to move on to LED’s.